Radiant your Skin Care with the [SNP] Bird's Nest Aqua Eye Patch! we aim to provide you best korean products to take good care of your skin, including Cosmetics, Masks, Patch. Hydra Patch online. 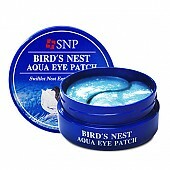 Eye patch supplies moisture and nourishment and firms sensitive skin around the eyes. 1. Nourishment supply, reinforced moisture, increased firmness. 3. Cooling & Soothing care. 4. 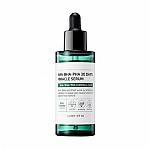 Skin turnover normalization- skin regeneration and exfoliation care. 5. Improvement of skin's brightness- skin tone care and whitening. 1. After facial cleansing, tone skin using skin toner. 2. Use spatula to attach eye patch on desired area and remove after 20~30 minutes. * Tip : It can be used to soften nasolabial folds. hay…@gmail.com Buy these you won't be disappointed. Doesn't ball up after using the patches like the heimish rose water patches, they are moisturizing though but feel like I'm wiping some of the product off why I like the birds nest patches better. Helps with fine lines. 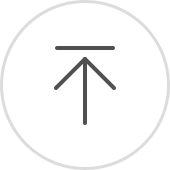 rya…@hotmail.com Helps relax your eyes and has a cooling effect. ach…@yahoo.com.au It has a pleasant fragrance. I feel a little pampered when using it. 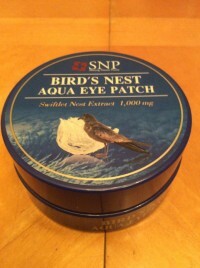 However, I haven't noticed a difference in my eye area since using this product. mis…@gmail.com Hydrogel eye patches are the best! 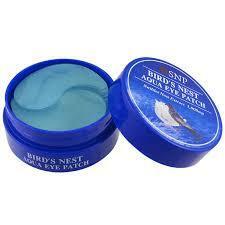 This particular has birds nest extract which we know is great for the complexion. The patches are easy to apply and feel beautiful. I use them twice a week I think. Great value eye patch that feels great and works well too! I use these when I want that cooling and soothing effect underneath my eyes. I got this in hopes that it'll help lighten my dark circles, keep it hydrated, and decrease puffiness. However, my dark circle have remained the same and the puffiness is still there.